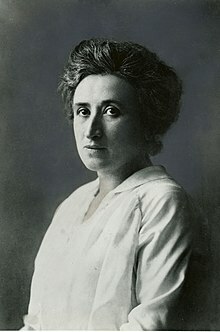 Rosa Luxemburg (5 March 1871 in Zamość, Russian Poland – 15 January 1919 in Berlin) was a Polish Marxist politician working in both Poland and Germany. Her birth name was Rosalia Luxenburg. She was born into a Jewish family. She was the fifth child of her parents. Her father was a wood trader/timber trader. His name was Eliasz Luxemburg III. Her mother's name was Line (maiden name: Löwenstein). She organised a socialist uprising in Germany but was killed by a right-wing group called the Freikorps. Rosa Luxemburg made many new communist ideas that continue to influence communism today. Rosa Luxemburg supported the Russian Revolution led by Lenin and Trotsky, but she saw them both as making undemocratic mistakes in organizing what was supposed to be a more democratic nation. She also insisted the freedom of assembly, freedom of the press, freedom of speech and abolition of death penalty. In 1913 she published an essay "The Accumulation of Capital" that urges that capital accumulation causes the imperialism. Rosa Luxemburg was murdered-executed by the Garde-Kavallerie-Schützendivision of the Freikorps. Wikimedia Commons has media related to Rosa Luxemburg. This page was last changed on 8 March 2019, at 13:03.